This is the first blog post since the project officially funded so it's another opportunity to say a BIG thank you to everyone who pledged and spread the word about our hungry, green friends! It feels amazing to be working towards getting this game actually made and I can't wait to get your copies of Gobblin' Goblins to you! I've launched straight into getting this thing produced, here's where we're at so far. So we had a stretch goal that would make the goblin cards bigger which we didn't hit. However I thought unlocking this would significantly improve the game so I decided to get a quote from the manufacturer anyway. Good news, it's affordable! So goblin cards will now be about Tarot size (120mm x 70mm). I saw a lot of gameplay videos that came in during the campaign where players were finding ways to display all the goblin info (powers and food preferences) in front of them. 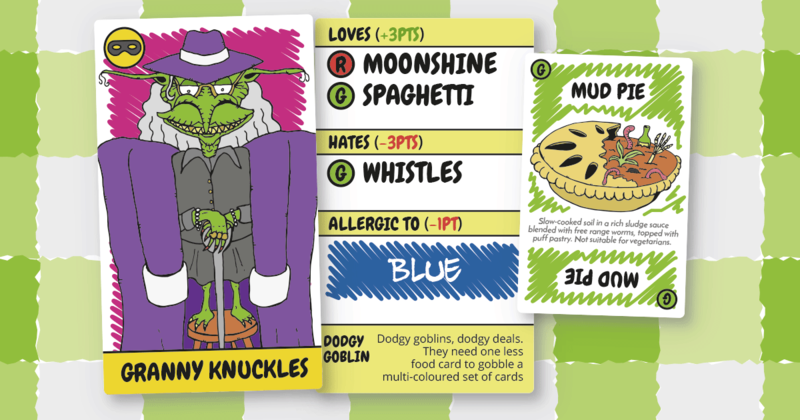 With the bigger cards, this has led to a fairly straight forward redesign to show all goblin information on one side. Here's a mock up below with a food card for comparison. I'm still tweaking the design of the front of the goblin card but this should give you the gist! With the quote in place I can now make some better estimates for the timescales of the project. Mid April is still the target for fulfilment but if we get ahead / behind schedule I'll let you know!